visible for peace. Join in! Iraq: an estimated 128,000 civilians and over 2,450 Coalition soldiers - dead from war. Israel and Palestine: over 4,800 killed since 2000. Sudan. Chechnya. Afghanistan. The list goes on. And on. All you "leaders" out there, listen. We - the people - want peace, please. 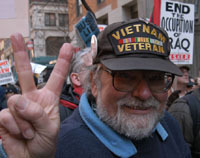 are by WF Cieben, taken at rallies in Washington D.C., New York and Philadelphia from February 2003 - August 2004. PEACE PLEASE is proud to present in its gallery a new exhibition by Cieben, "People for Peace". To visit the exhibit click on the picture above or any of the photos throughout PEACE PLEASE. 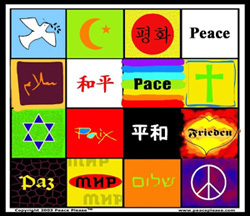 PEACE PLEASE™ is about peace, and peaceful coexistence. Through PRODUCTS, a Gallery and a message channel - Voices for Peace - our goal is to provide people with a visible means to express their voice and vote for peace. We give money from sales to groups that promote peace and coexistence in addition to helping fund the creation of a peace channel. Please join our mailing list if you'd like us to keep you posted about new items and other developments. Peace. Let's make it happen. Copyright © 2006 The Peace Channel Network, Inc. All rights reserved.